Dustin Johnson talks with a rules official on the 5th green during the final round of the U.S. Open at Oakmont Country Club. 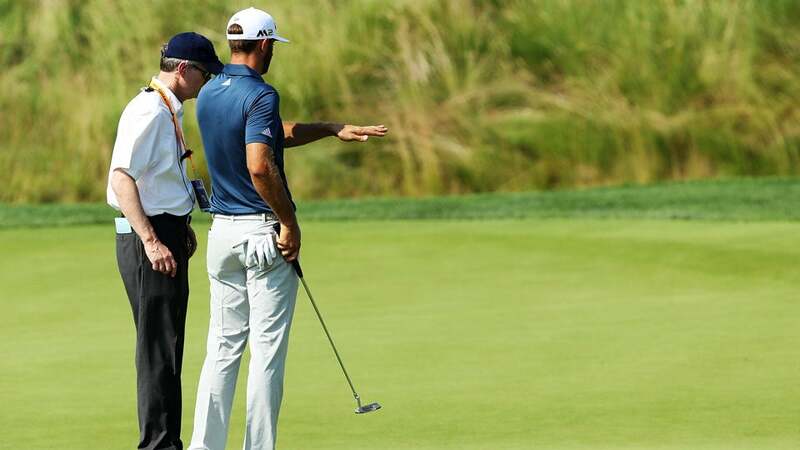 OAKMONT, Pa. -- When Dustin Johnson's ball moved on the 5th green during his final round of the U.S. Open, he stopped and made sure he interpreted the ruling correctly. More than an hour later, the USGA informed Johnson it was unsure if he should be penalized a stroke under the idea that he had forced the ball to move. The USGA notified Johnson that the action on the 5th green would be reviewed and ruled upon at the end of his round. Naturally, this move by the USGA garnered plenty of attention, specifically from PGA Tour players. Rory McIlroy was one of the first to sound off, followed by many others, including former U.S. Open champions Jordan Spieth and Webb Simpson. This isn't right for anyone on that golf course. If it was me I wouldn't hit another shot until this farce was rectified. That rule HAS TO change @USGA, PLEASE! Lemme get this straight.. DJ doesn't address it. It's ruled that he didn't cause it to move. Now you tell him he may have? Now? This a joke? This entire thing with DJ is absolutely unreal. Hope he wins by 8. What is the @USGA ? So you're gonna tell a guy w/o a major that's leading that he may not be leading after one of your white hairs already cleared him @USGA?! ?